Welcome to our new continuing series Ghibli Rocks looking at the work of Hayao Miyazaki and Studio Ghibli as a whole. Next up is the Ghibli adaptation of the children’s classic The Borrowers, The Secret World of Arrietty directed by Hiromasa Yonebayashi (When Marine Was There) released by GKIDS/Shout Factory on Blu-Ray. There’s a delicacy and sensitivity to the way that Studio Ghibli approaches all of their films that make them warm and inviting in a way that is unique to their brand. Of the studios entire film catalog, The Secret World of Arrietty is by far the warmest and inviting of all. Adapted from the classic children’s series The Borrowers by Hayao Miyazaki himself and directed by Hiromasa Yonebayashi. The film has all those traits housed in a spirited adventure fantasy with a strong heroine in Arrietty. There have been many adaptations of The Borrowers but none managed to capture the spirit and the English-ness of the Mary Norton series’ the way that The Secret World of Arrietty does so effortlessly. Part of the magic comes from Miyazaki’s adaptation never conforming to some or of plot mechanics or histrionics. Though there are stakes and there are some specific antagonistic plot points, these never seem out of place. Rather they are a part of the cohesive story of a family trying to survive as a young woman finds her place in the world. Miyazaki’s adaptation manages to make it about a family of Borrowers or tiny beings as a secondary to everything else. Similar to Spirited Away director Yonebayashi and Miyazaki create a world of wonder that feels lived in but fantastical. The design though beautiful and an impressive feat of animation is always keeping the story’s themes within reach. Yonebayashi never takes the films lush design too far out as to take away from the characters. Much of fantasy relays heavily on the fantastical elements rather than leaning on the humane/character elements. The script and direction ensure this is never the case. We learn about the world that Arrietty inhabits with her father Pod or mother Homily by where they live. We learning the rules they must obey to survive by Arrietty and Pod having to journey out. These elements could be played with wide eye Spielbergian wonder but they’re not. These are played as normal every day occurrences. By default as the film never pushes the wonder we are grounded in the story. Arrietty is never described in the film, there is no need because they simply show us how resourceful, intelligent, caring albeit a bit reckless she is. The human component of The Secret World of Arrietty is secondary to the world of the Borrowers. Though it the humans are there to drive the plot forward. Yonebayashi and Miyazaki never make it such a blunt or startling plot mechanic. The humans Sho, Maki and Haru always seem like characters and never plot devices though much of what they do is. Miyazaki’s script imbues them with warmth that even the films “antagonist” Haru always seems human. At their core though they are designed to counter or complement Arrietty’s journey. Arrietty’s character journey is exactly what pushes the plot forward. The reckless of her youth has repercussions that echo through the film. Rather than make this the clichéd plot of a family being at odds with one another, The Secret World of Arrietty completely dodges that. The film rather has Arrietty, Pod and Homily deal with the issues they are presented with. In a world of family films where arguments are the bread and butter of drama The Secret World of Arrietty rather beautifully shows a family working together. Arrietty is never blamed by her parents, which is in it of itself a powerful statement, only told what needs to happen. Growing up is painful, sad, adventurous and wonderful often times all at the same time. 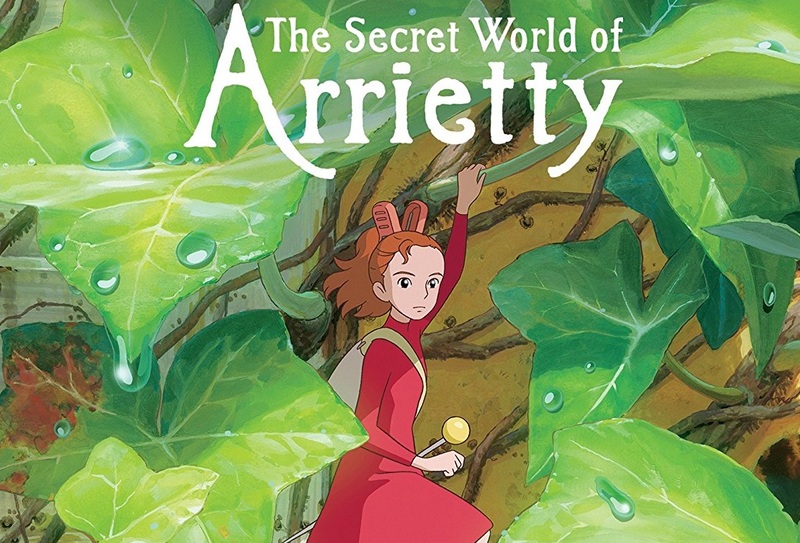 The Secret World of Arrietty shows us just that in Arrietty. Through her we see not only a world filled with wonders and beauty but the responsibility one accepts in their journey to adulthood. Fantasy has always been fertile grounds for themes in the right hands. The Secret World of Arrietty is just that thanks to Yonebayashi and Miyazaki. This disc appears to be the same transfer from the Disney Blu-Ray. This definitely isn’t an issue as the transfer is gorgeous. The transfer is razor sharp without any grain present (which is what one wants from Animation). Bravo to Shout Factory/GKIDS’ for continuing to get these transfers and encoding them perfectly. The entire film has been presented in Story Board format. Further making this special, these are Miyazaki’s own hand drawn storyboards. It’s a fascinating watch toggling back and forth between the completed film and story boards. These storyboards give insight into how detailed Miyazaki gets with the design and how these were adapted by Yonebayashi. It’s akin to getting a running screenplay showing next to the finished film. The interviews from Yonebayashi and Miyazaki are interesting as they actually give some real meat to the pre-production and production of the film. The interviews amount to about thirty to forty minutes of extra content. This was not included on the original Blu-Ray release of the film. The Music Videos (there are two) and Trailer included are normal EPK items, nothing to write home about. This beautiful adaptation of The Borrowers series continues on the tradition of telling great female centric stories from Studio Ghibli.